Toronto Mayor John Tory announced the next phase of the city's Vision Zero plan on Wednesday, vowing to make the streets safer for pedestrians and cyclists. Lowering speed limits on arterial roads around the city. Installing more red light cameras. Putting in photo radar systems to catch speeding drivers. Adding more signals to intersections to give pedestrians a head start. Tory said the "Vision Zero 2.0" plan comes after studying pedestrian deaths in Scarborough, which has the highest ratio of fatal pedestrian collisions in the city. Of the 41 city-wide pedestrian deaths in 2018, he said, 16 were in Scarborough. 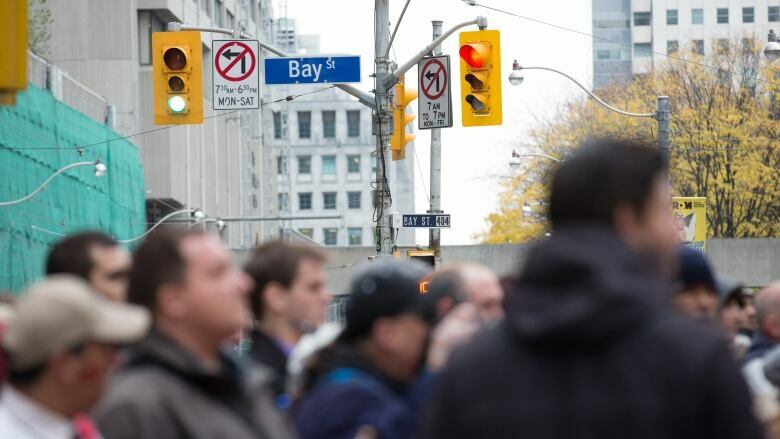 The city found that many people have to walk up to an extra six minutes to reach a protected crossing in many areas of the inner-suburb, something that leads many to jaywalk and put themselves at risk. 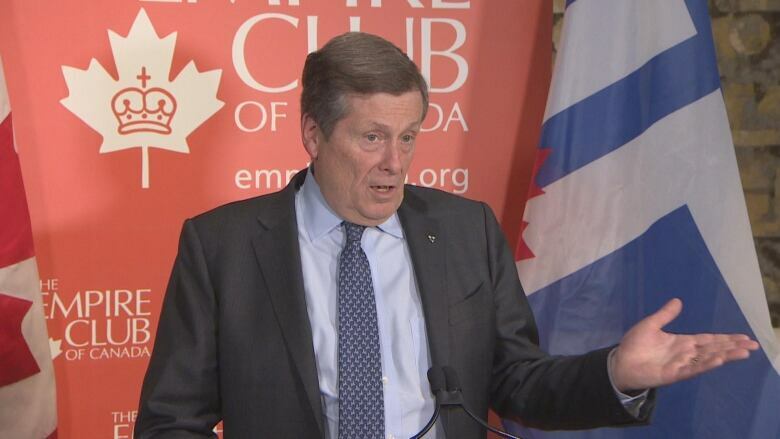 "A six-minute walk is quite a hike, especially for our city's senior population or school-aged children," Tory said in the written version of his speech to the Empire Club. "The reality is, especially if your destination is right across the street, many people will simply not walk the extra 12 minutes and will instead cross mid-block." Scarborough also has the most high-speed arterial roadway, the city found, which contributes to pedestrian deaths. Tory said he's also fighting for automated speed enforcement, something that will require provincial approval. Last year, the city tested new photo radar systems around the city and "the results were very concerning." One driver on Queen Street was going 127 km/hr, he said. On Renforth Drive, where the limit is 40 km/hr, one person was caught driving at 202 km/hr, Tory said. Tory said he will push staff and the province to ensure that speed cameras are in school and community safety zones by the start of the next school year. There will also be "significantly" more red light cameras, the mayor said, noting that vehicles speeding through red lights is another major reason people are getting killed. "Clearly our experience in Scarborough and across the city has indicated we have to do more," said Tory, who says they will consider reducing speed limits on roads across Toronto. Reducing speed limits and adding more crosswalks involve a relatively "modest" amount of money, Tory said, and can be done fairly quickly after council approval. This plan still requires a city report and debate at council. Tory's latest comments follow a decade-long trend towards rising numbers of traffic-related deaths on Toronto's roads, according to police data. Pedestrians are the group most often impacted, with more than 330 people killed since 2008 — making up nearly 60 per cent of the overall death toll. And so far in 2019, police numbers show there have been at least nine pedestrian deaths. The deaths come despite installation of hundreds of "safety zones" promoting lower speeds, dozens of intersection changes to give pedestrians a head start, and the installation of additional red light cameras, bike lanes, and speed humps. Jared Kolb, executive director of Cycle Toronto, said Wednesday's announcement gets the city closer to its goal. Collisions will keep happening, Kolb said, but "speed is the factor that ultimately is leading to the dramatic rise" in people getting killed and seriously injured on Toronto roadways. Toronto's five-year, $109 million Vision Zero plan launched in 2017, aimed at reducing traffic-related deaths and injuries on city streets. Still, road safety advocate have questioned the efficacy of the initiative given the high number of people being killed. "The ongoing and increasing traffic deaths indicate it clearly has not been effective," said Yvonne Verlinden, project manager at the Centre for Active Transportation. "It's been a lot of quick fixes and putting up signage ... There was hope that would lead to results and clearly it hasn't." Verlinden said speed limits can have a "huge" impact. "If you get hit by a vehicle moving at 30 kilometres an hour, that's a very different situation from getting hit at 60 kilometres an hour," she said, noting that suburbs have many high-speed roads where people walk. Kolb noted that Vision Zero has been largely disconnected from cycling. He said the city needs to look at protected bike lanes as a way of creating safer streets for both cyclists and pedestrians.